Pork ribs with a low sugar BBQ sauce. Find out how to create a spicy and naturally sweet BBQ sauce without using ketchup or cups of added sugar. Last month my family joined me in a 10-day sugar cleanse. I had wanted to do one since October, but then Halloween, and Thanksgiving, and all the holidays! All of those things made it, well, challenging to commit to nearly two weeks sans sugar. I’m just weak and can’t give up the sweet deliciousness of the holidays. But we finally did it, and it was pretty awesome. I’m actually surprised by how easy it was. Sean had more challenges than I did, mostly because he’s used to eating out for lunch, making most deli sandwiches off limits (since most sandwich breads have added sugar, not to mention sugar added into the brines of deli turkey meat). I took the challenge by making homemade bread for my family. Thanks to my dear friend and neighbor, Katy, who taught me how to make my own homemade sourdough we’ve been making 1-2 loaves a week for sandwiches and morning toast (thanks, Katy!!!). One of the challenges has come in things like dry rubs and BBQ sauces for the foods we like to cook. This meant zero brown sugar in any dry rubs (gasp!). And most BBQ sauces were also off limits because they are full of sugar. Don’t even get me started on store bought sauces. 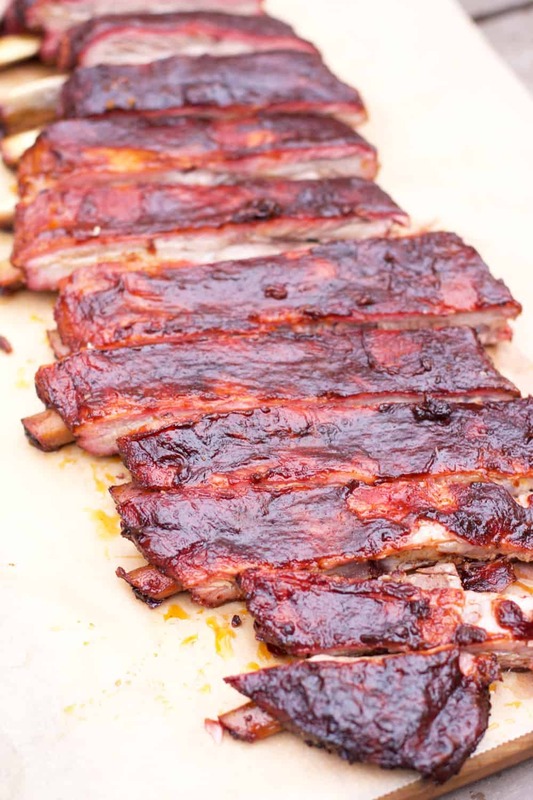 The challenge with ribs, for example, is that dry rubs and BBQ sauces are usually full of added sugar. So, in line with making homemade bread, I thought it would be an opportune time to start playing around with homemade BBQ sauces that minimizes added sugar. And let me clarify, we were using no sugar in our cleanse (no artificial or real). We were also avoiding maple syrup, agave, honey, you name it. All sweet flavors had to be natural. Fruit was fine, so long as it was fresh or frozen (with no added sweeteners). Could we come up with a BBQ sauce that had the sweetness people expect but with no added sugar? Challenge accepted. Well, almost. More on that in a minute. We found the best test subject for this – Ribs. While Sean stands by his dry ribs, I’m a sucker from time to time for sauced ribs. 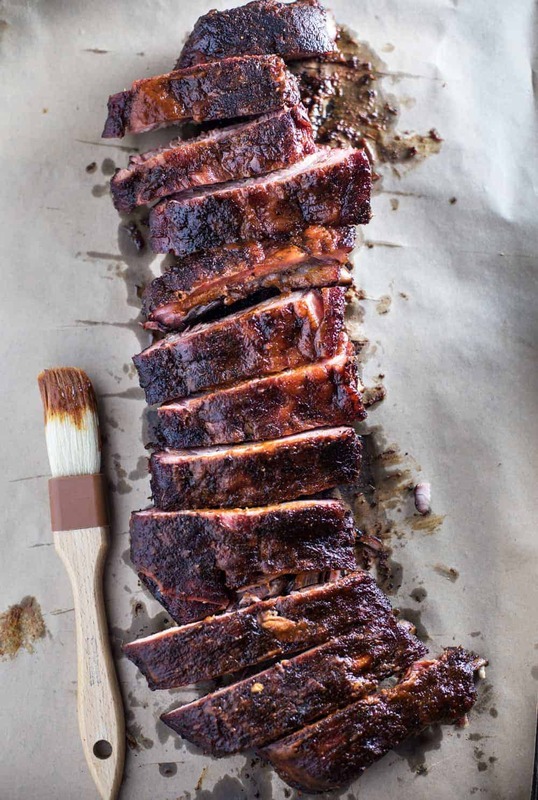 Many people appreciate their ribs wet, or sauced, meaning doused with BBQ sauce. 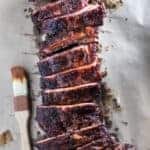 You can read our experience smoking ribs for a BBQ competition here and what we learned about preparing ribs for a competition. Not gonna lie, as much as I love me some salt and pepper ribs, there’s something indulgent about finger licking saucy ribs. Don’t judge! So now, how do we get the sweetness if we are trying to minimize added sugar? I started by caramelizing some onions for our sauce, which really brings out the natural sweetness in the onions. Caramelized onions are insanely delicious and I was hoping they’d add some richness and sweetness to the sauce. Instead of ketchup (which usually has lots of added sugar) I used tomato sauce and tomato paste to get it to the richness and consistency I wanted. I added the usual suspects for heat and flavor (chili flakes, cayenne, paprika). I then added about a cup of frozen mango cubes to achieve that natural sweetness I was looking for. One cup of mango cubes was the happy spot for me. It had a great balance of sweetness, spiciness, and richness. But if you prefer more sweetness feel free to add more mango cubes (I suggest adding it by ¼ cup increments at a time so you don’t overdo it). 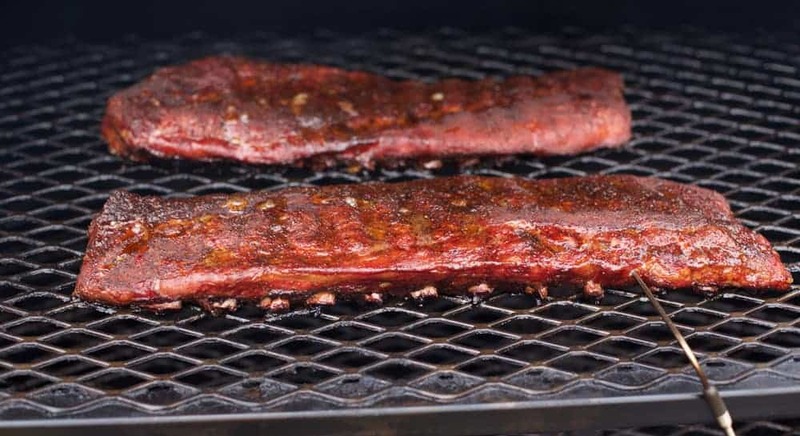 Now that you have your sauce, next up smoke your ribs. We used baby backs for these ribs. Awesome flavor. Remove any silver skin that is on the bone side of the ribs, and trim off any excess fat. 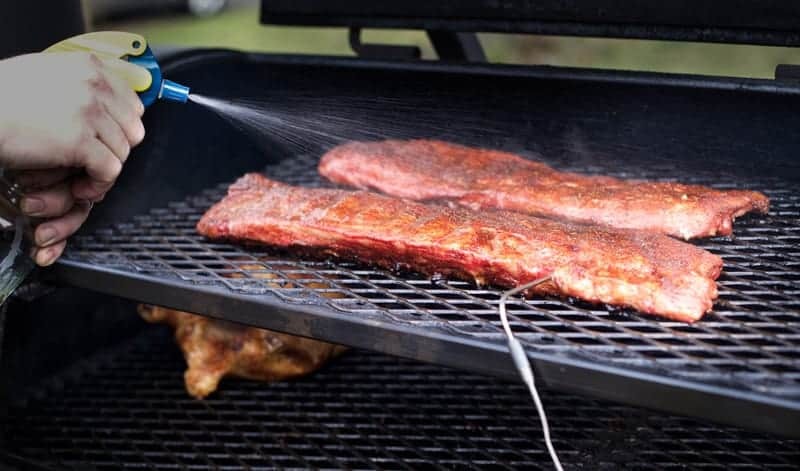 First put a coating of mustard on the ribs so the dry rub will stick (we use Dijon, sticking to our no added sugar commitment), then apply your favorite dry rub. Wanting to keep the sugar to a minimum? Try equal parts salt and pepper and liberally apply. You are adding a sauce slather at the end of the cook, which will add additional flavor. For our rub, we went heavier on savory flavors like onion powder, dry mustard and paprika to offset the typical mix of sugar. But if you want simple, go kosher salt and coarse ground pepper in equal parts. I like to keep the temperature hovering at 225 degrees. It means it will take up for five hours for a rack. Also – have a water bath in the smoker keeping the interior humid. 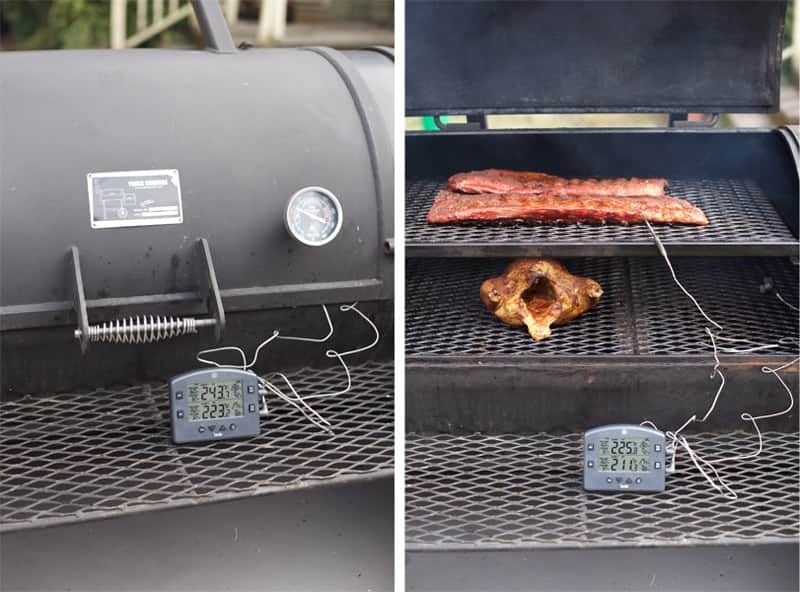 We used Smoke thermometer by ThermoWorks for these ribs. During the first 3 hours, you’ll want to spritz your meat occasionally to keep it moist. We use apple cider vinegar. It adds a touch of sweet due to the apple, so a nice way to offset a savory rub. When comes time to wrap the ribs, place your meat on some foil or butcher paper, generously apply your BBQ sauce, then wrap completely. Here is where the “almost sugar free” comes in. After the sugar cleanse, we took the same sauce recipe and added some molasses and ¼ cup of turbanado sugar for comparison. There is definitely some depth of flavor and smokiness that the molasses and sugar adds to the sauce. But contrast that with tomato paste which has concentrated flavor and the mango with the natural sugars, and we definitely didn’t miss it that much. So we’ll keep experimenting because with other options like ripe berries, there seems to be room for making another no sugar added sauce that still provides lots of flavor. It may not work at a BBQ competition, but it will definitely please your guests for a backyard party. Smoked Pork Ribs with a low sugar Spicy Mango BBQ Sauce. 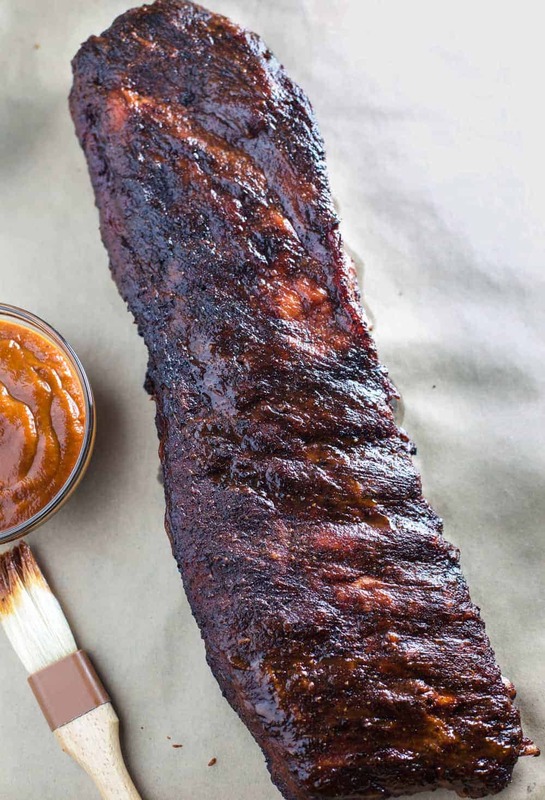 Learn how to create a spicy and naturally sweet BBQ sauce without ketchup or excess sugar. Preheat your smoker to 225 degrees, we used cherry wood to add color and a sweet flavor. Add a water pan. Prepare your ribs (can be done the night before) by removing any silver skin on the bone side of the ribs. Apply your mustard and coat ribs and then apply your rub liberally. 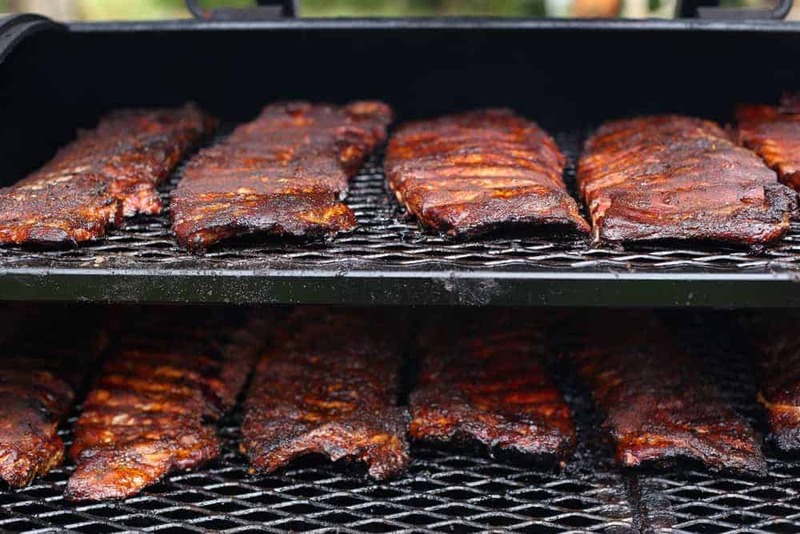 Place ribs on the smoker bone side down for approximately 90 minutes allowing bark to set on ribs. Then for the next 90 minutes, spray your spritz every 15 minutes. Once bones start to show, it's time to wrap. 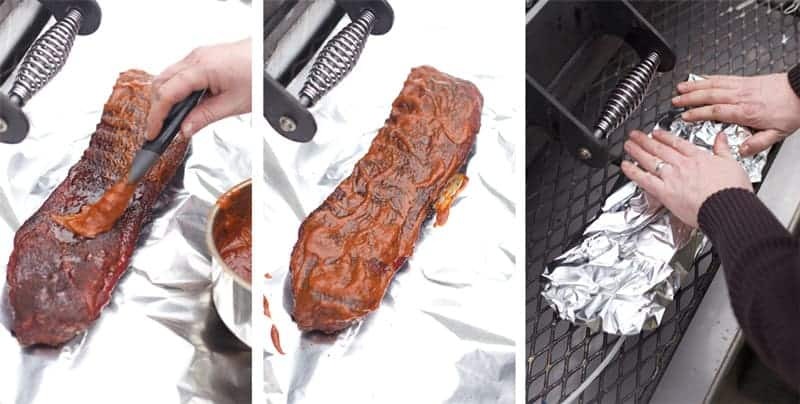 Remove ribs from the smoker and place in foil. Add a generous amount of your sauce by coating the ribs and then wrap meat side facing down. When wrapping, wrap tightly. Place back on smoker for 2 hours. After hour 2, remove ribs and carefully open the foil. Gently coat both sides of the ribs with your sauce and place back on smoker with bone side facing down. This will tack up the sauce. Remove after 30 minutes to 1 hour or until the sauce looks like it has set. In a large pot set to medium heat melt 1 tablespoon butter and 1 tablespoon olive oil and add the onions. Stir occasionally until the onions are soft (golden/starting to brown), and sweet to the taste (roughly 20 minutes). * you may need to adjust the heat and turn it down if they are browning too fast. Next add the garlic and jalapeno and stir together for 2 minute. Add the apple cider vinegar, molasses, tomato paste, and mix. Add your dry seasonings, Worcestershire and lime juice, and the mango cubes and bring to a simmer. Cook for 10 minutes, or until the mango cubes have softened. Using a hand immersion blender, or countertop blender, blend your sauce until smooth and there are no chunks. Have you experimented with making sugar free sauces like BBQ sauce? What are some of your tips and tricks? We’re going to continue experimenting, especially as more and more folks are becoming conscious of the impact sugar can have in your diet. *This post contains an affiliate link for the ThermoWorks Smoke digital read thermometer. We only recommend products we use and love! And you can’t smoke meat to the perfect temperature without a good thermometer, and this one is awesome. Yay for yummy low-sugar food! I’m glad you avoided the artificial sweeteners too…yuck. And thanks for the sourdough shout-out! So glad you all like it as much as we do. Soon we’ll need to do a carb-cleanse…ugh! Mmmm… I love mango with smoked meat, and this mango BBQ sauce sounds amazing. Your ribs sound delicious! I love the idea of mango in the sauce! sounds like a great recipe to try on my Big Green Egg next Summer. I like the low sugar aspect of this recipe.